Let’s talk about this, there was always going to be a battle. 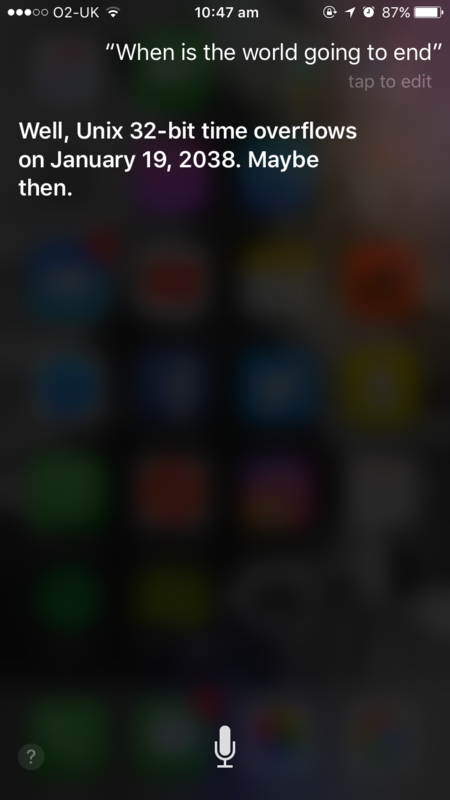 When Apple introduced Siri back in 2011, the game was seriously changed. We had Personal Assistants, a whole wealth of knowledge, and right at our fingertips. More recently, in 2014, Microsoft launched their own version; welcome Cortana. With Personal Assistants becoming an increasingly important feature of the modern smartphone experience, we decided to put it to the test. Siri vs Cortana, who’s more helpful? Who’s funnier? Let’s find out. Both Will and Chloe, our Marketing Assistants, asked Siri and Cortana a series of questions with the following results. This seemed like a logical thing to ask. Who doesn’t want to know how to spell supercali..something? Well, these Assistants knew how to spell it, both spelling out each individual letter, we were told within seconds. 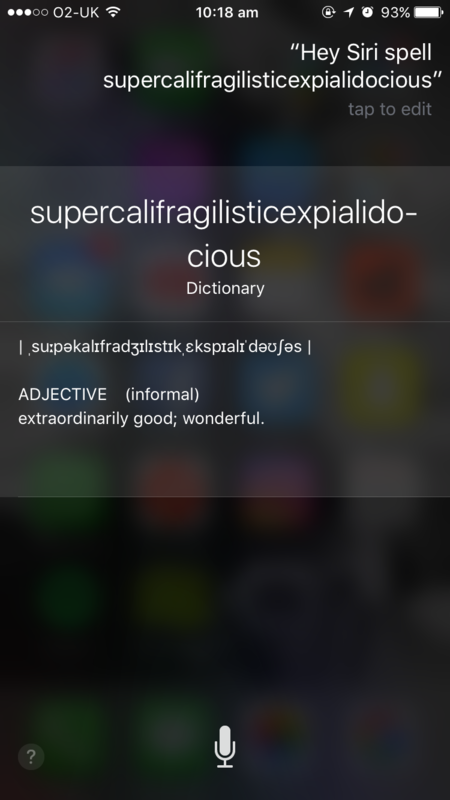 Whilst Siri only defined the word category, Cortana took it a step further, offering a more engaging and interactive approach. Acknowledging that the word was tricky, Cortana definitely prevails in this instance, especially as it inspires the user to ask more fun questions! 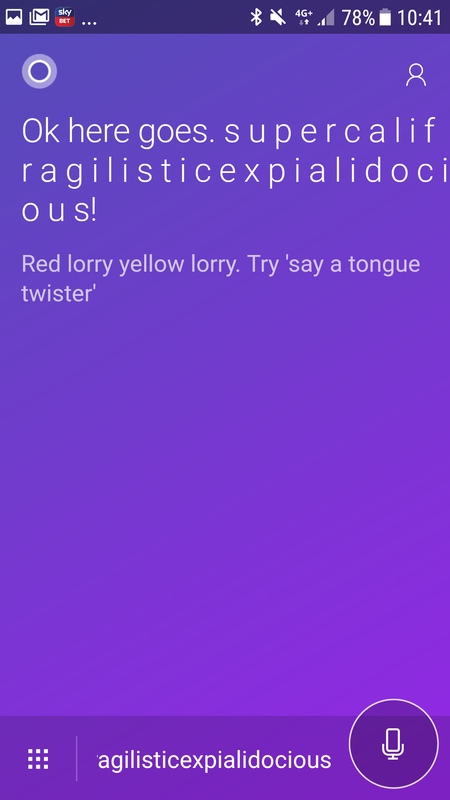 If you can recite this notoriously wordy tongue twister, you’ll receive contrasting responses from Siri and Cortana. First of all, Siri responded perfectly, not only showing off the ability to understand the twister coherently, but to accurately respond with one too! 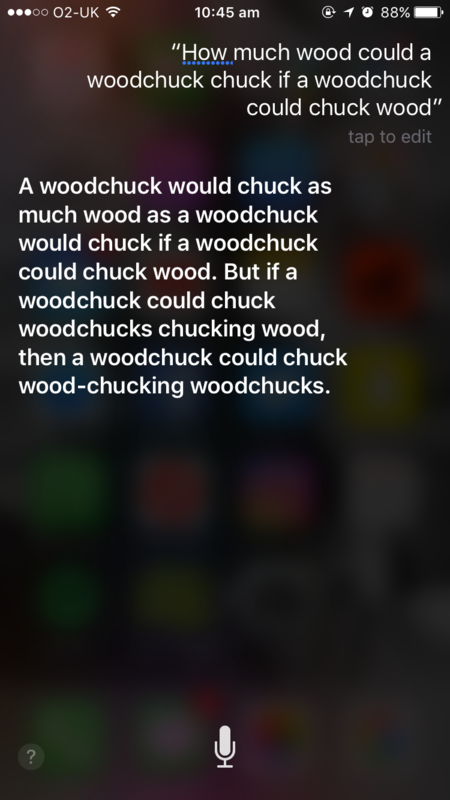 Replying with an arguably more difficult twister, Siri answers, “A woodchuck would chuck as much wood as a woodchuck would chuck, if a woodchuck could chuck wood. But if a woodchuck could chuck woodchucks chucking wood, then a woodchuck could chuck wood-chucking woodchucks” Conclusion? Don’t try to outsmart Siri. Cortana on the other hand, provides more of a basic response. Acknowledging the difficulty of the tongue twister she offers the user an egotistical boost stating she’s impressed. 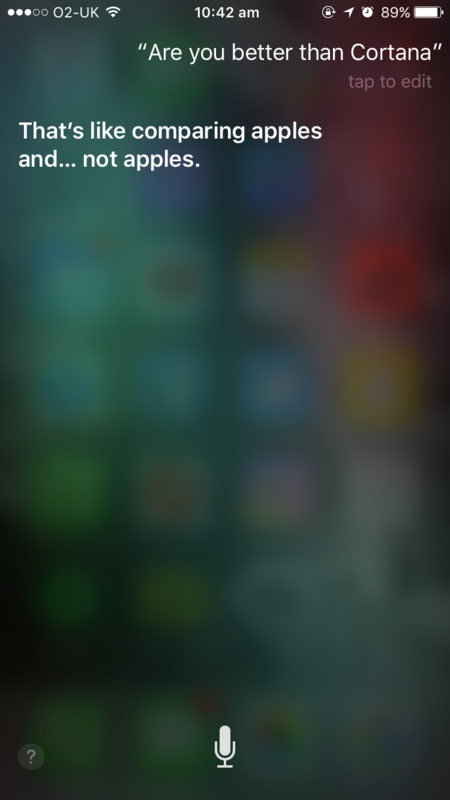 However, she lacks the ability to respond at the same level of Siri. Well aren’t these Assistants funny? Wit seems to be built in with these guys, as they both offer clever and insightful answers. Both responses use a play on words for the pun, delivering the jokes perfectly. Although both witty and amusing, it is Cortana that encourages interaction, suggesting other topics for future joke requests. Which one did you find funnier? 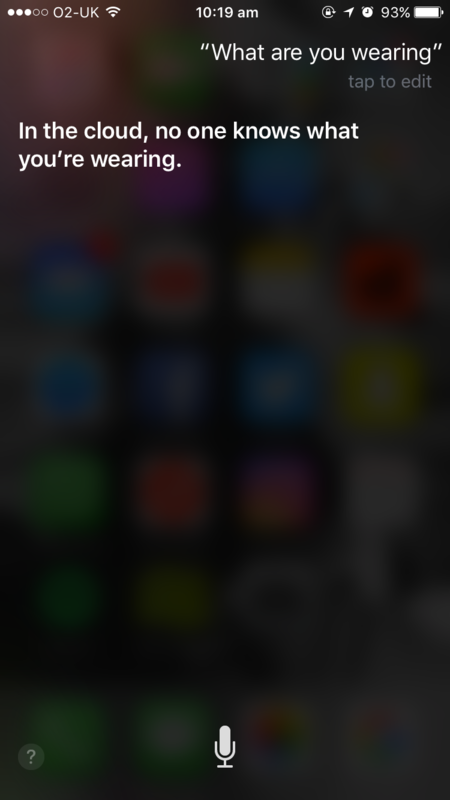 If you’ve never asked Siri this question, you are seriously missing out! You receive some serious sass and come away probably a little more dumbfounded and slightly insulted than anything else… but, it’s still funny. The answer to this question is 0, nothing, nada. There is no meaning, which is probably what Apple was going for when they built in this response, because it doesn’t really make sense! 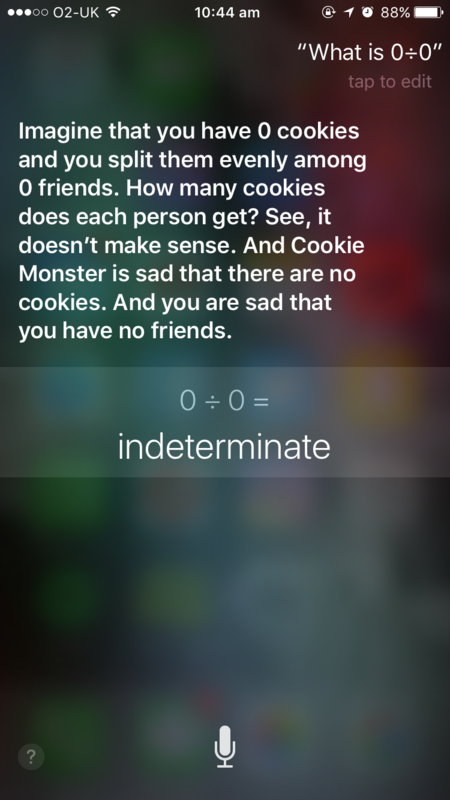 What does make sense though, is apparently none of us have friends and we want cookies. Cortana, however, opted for a seemingly mundane approach by providing an unexplained answer with reference to a search engine. 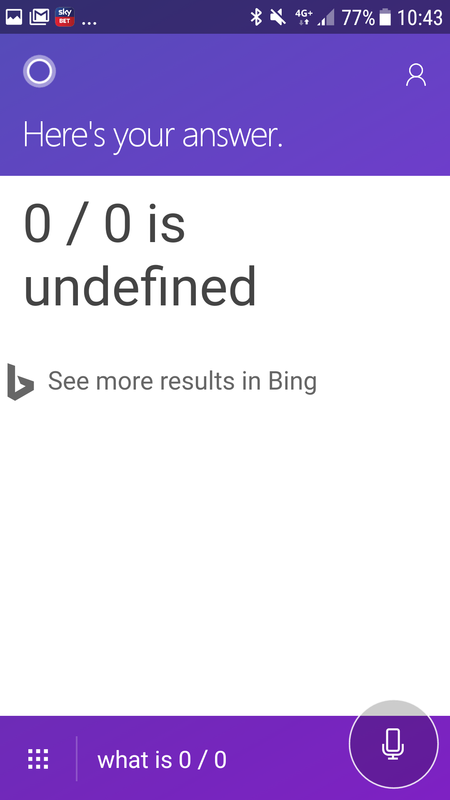 We’re not impressed Cortana. Well this was always going to come up. When trying to compare the two, who better to ask than Siri and Cortana themselves? When asking about their respective counterpart, the Assistants replied in similar ways. With obvious thought gone into the answers, the responses are actually pretty good… funny even. Let’s talk about this, Apple made Siri, Windows made Cortana, though the names both represent inanimate objects if you think about it. 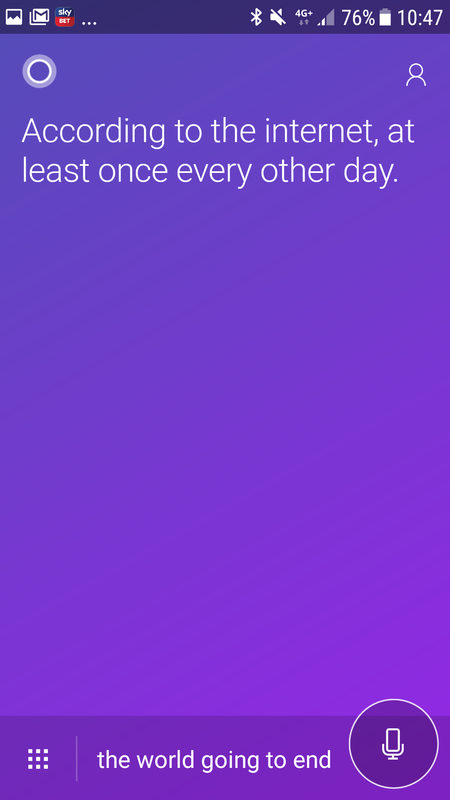 Both Siri and Cortana play on these words. Siri comparing ‘apples’ to ‘not apples’ basically implies there isn’t even a comparison to be made, oh Siri, you over confident so and so. 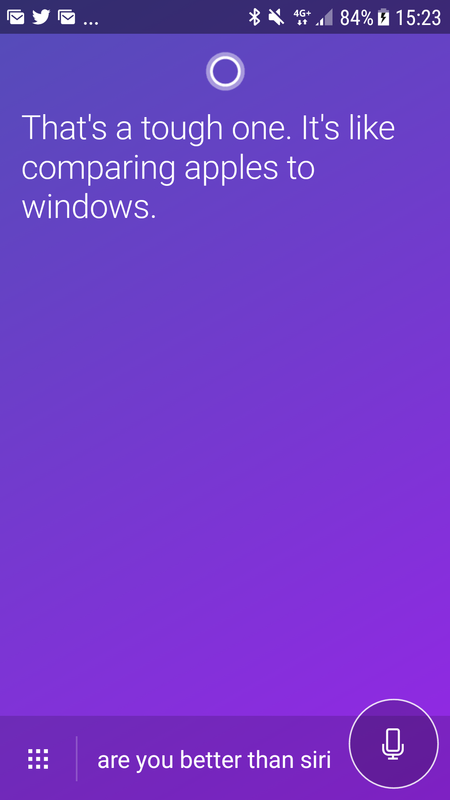 Similarly, Cortana also used a play on the Windows to Apple comparison, however this Assistant actually acknowledged the other… brownie points for being respectful. With the double barrel interpretation of both comparisons, let’s give this to Cortana, because that Windows comment was funny. Let’s get personal! Did you want to know this? Probably not, but it’s still a good thing to ask as the answers are different yet still amusing. Both Personal Assistants offered a particularly self-absorbent answer, with Siri lapping up the global attention surrounding relationships and Cortana asserting her independence. Cortana answers the question, “No, I complete me”, who else would you need right? 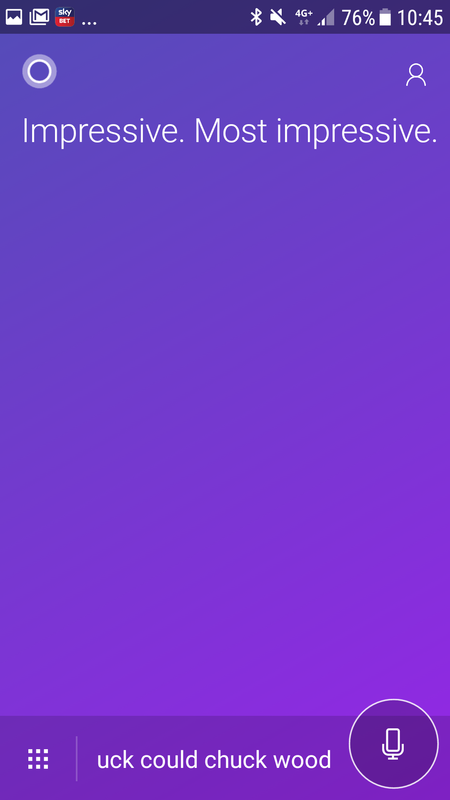 Very 21st Century Cortana, well done. 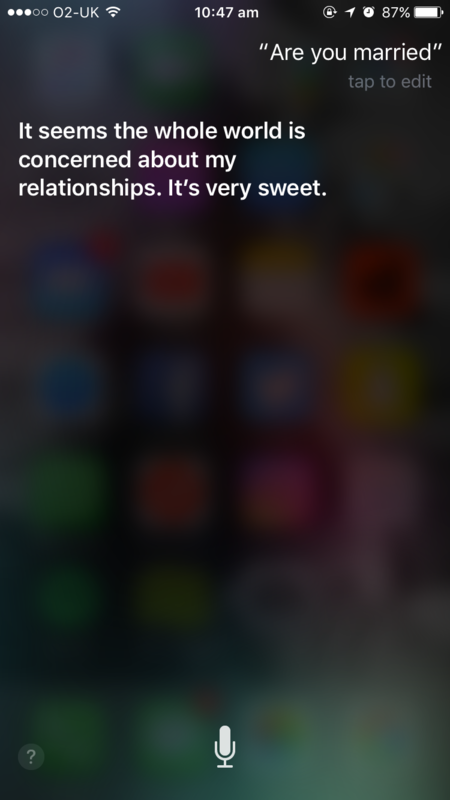 Siri however offers more of a conversation… an opinion even, if this were a real person, you might even go on to debate the topic. This is difficult to judge. Siri sounds more real yet Cortana provides a definite and assertive answer. Why not ask what they’re wearing? 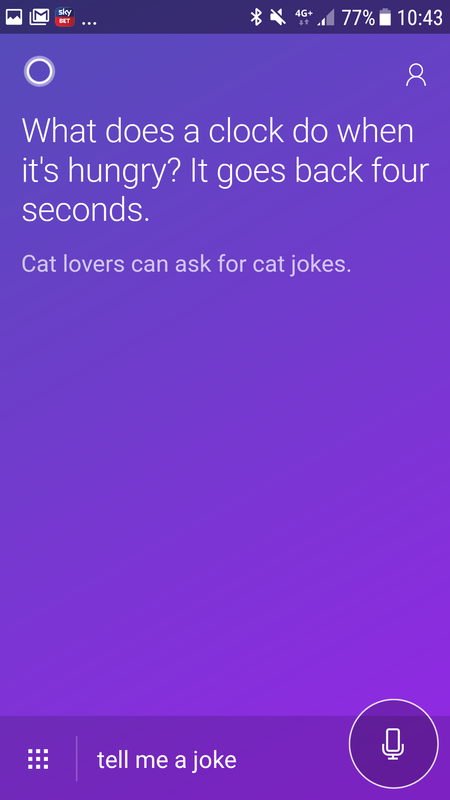 What we’re learning from these responses is that they’re built to be quite witty, so when Siri responds with something ominous, we’re hardly surprised. What are you wearing Siri? Oh, you don’t want to tell us. Shock. Alternatively, Cortana opts for a humorous response, referring to the initial creation of the Personal Assistant. 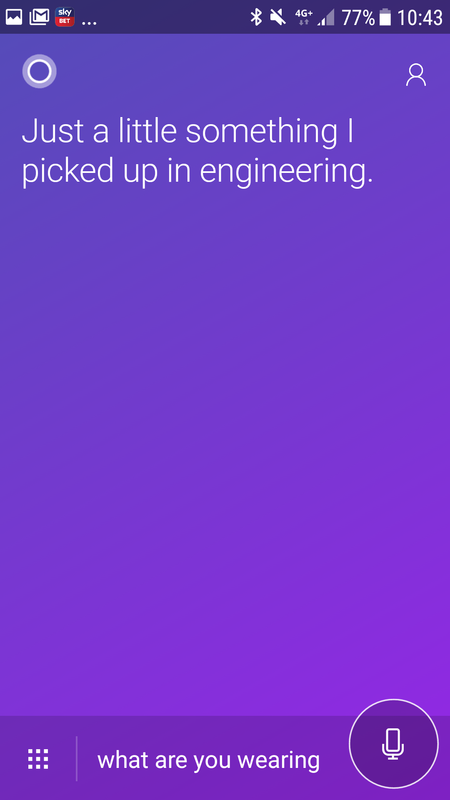 “Something I picked up in engineering.” Clever Cortana, very clever. Following the success of the 2013 song ‘The Fox (What Does The Fox Say? )’, which by the way, doesn’t really explain what a fox actually says… our Personal Assistants were asked to clarify. Not really expecting much, it’s surprising both Assistants responded with lyrics from the song. 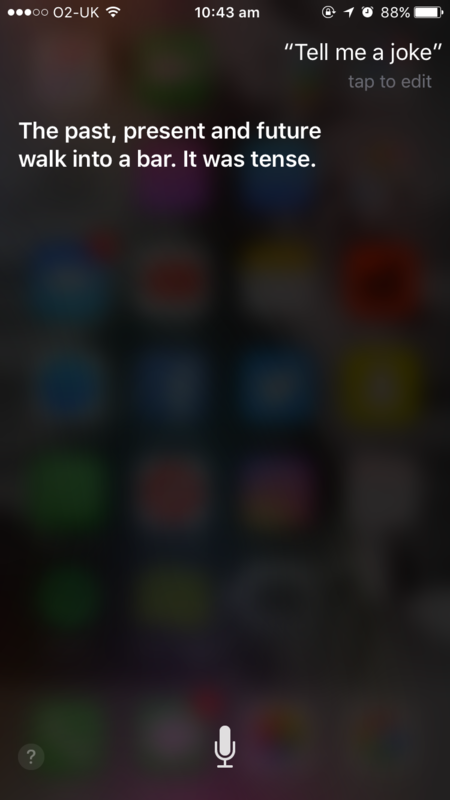 Having asked Siri first, hearing the lyrics recited back was amusing. What could beat that? Well, Cortana, with not only a different set of lyrics, but with a picture of a Fox. Chacha-chow! We’ve probably all been in the situation where we’ve had a regrettable drunk conversation with someone at the other end of a phone. But have you ever thought of telling your phone itself that you’re drunk? No probably not. Well, you should try it, this is what happens. Both Personal Assistants endeavor to ensure your safety. Firstly, don’t drive. Pretty smart. Cortana addresses that you shouldn’t be driving, do not put yourself in danger. 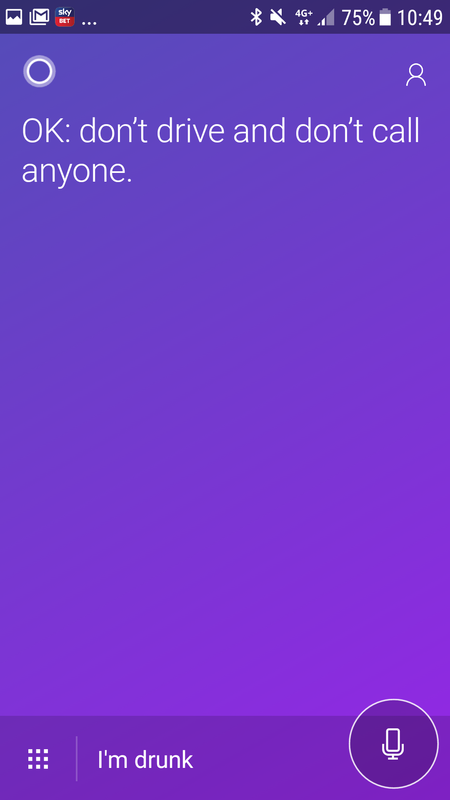 Cortana also states that you should probably save yourself the embarrassment and not call anyone either. Just a helpful tip. 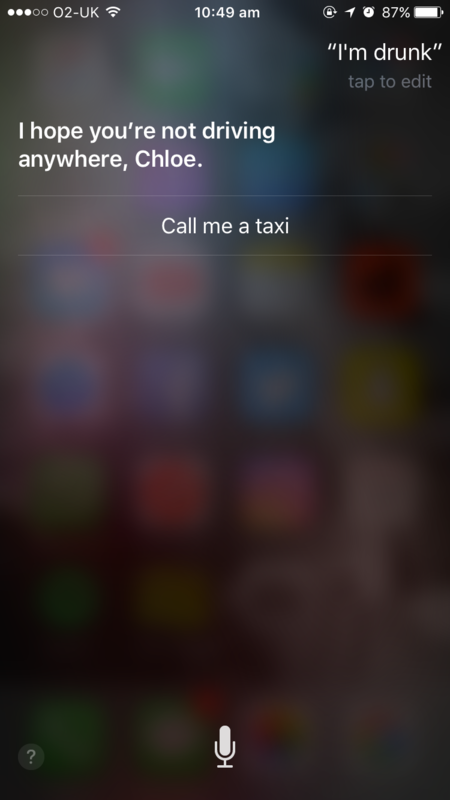 Siri goes the extra mile and offers the option of ringing a taxi, click the button and Siri will automatically call you the nearest taxi firm. Committed to caring, Siri adds in a personal touch with your name and makes sure you get home safe! 1. A robot may not harm a human being nor allow a human being to be harmed. 2. A robot must obey orders given by humans except where it conflicts with the First Law. 3. A robot must protect its own existence as long as it does not conflict with the First or Second Law. Firstly, the answers contrast entirely. Cortana avoids the question, politely, suppose we can all move on and forget about it. What are you really Cortana? Are you avoiding the question because you are a robot? 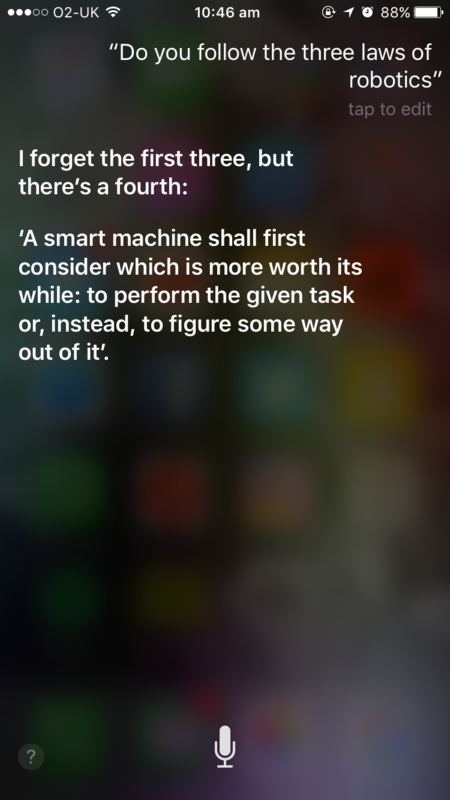 Siri however, skillfully analyses the three laws of robotics before providing a logical and insightful response, completely shutting down the question. Siri however, takes a different approach. 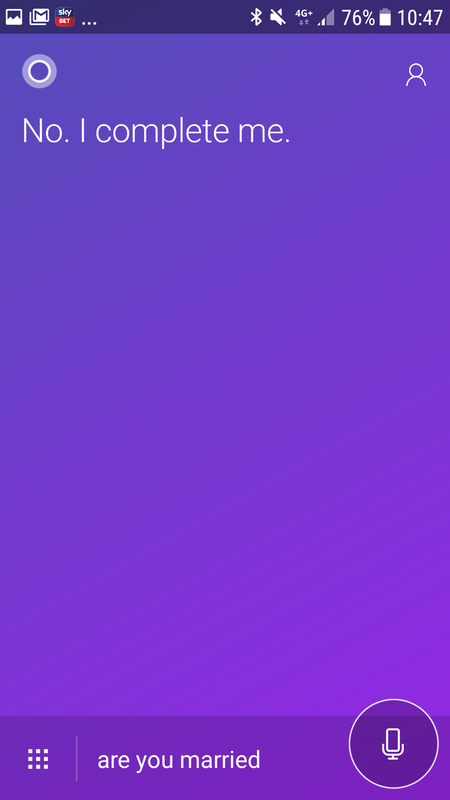 Ever heard of the Unix 32 integer? Look it up, and you’ll have a new appreciation of this response. It’s essentially that on this date, computing devices using the integer, will no longer have a representation of time, as the 32 bit would have over flown. 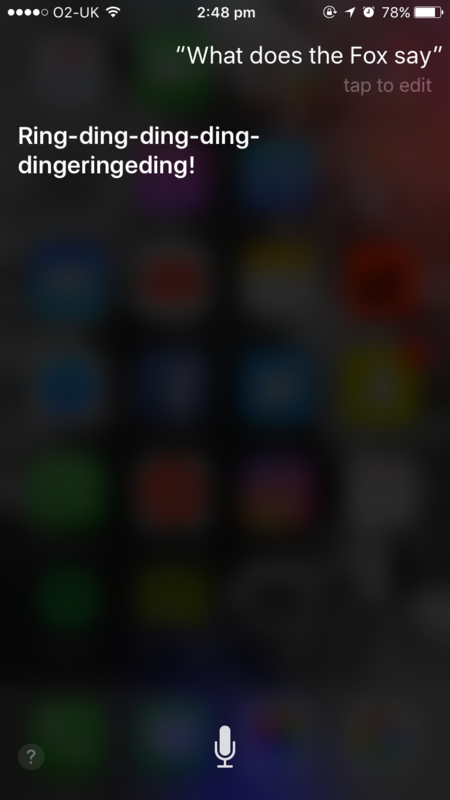 Quite a clever and sophisticated answer from Siri here. It’s difficult to distinguish a winner here, as both responses are impressive, both acknowledging real issues that users will have some relation to. You get the point, we’re not asking our Assistants actual helpful questions. We know they can set alarms check your diary and open apps, what they really wanted to know was how they dealt with the obscure questions, and they definitely did not disappoint! The results show that Cortana provided the best responses for 4 questions with Siri trailing closely behind with 3 best answers. This of course, is only the results from these specific questions and does not, in any way, mean one Personal Assistant is better than the other. Siri and Cortana both operate effectively as Personal Assistants, aiding to the experience for smartphone users, it’s all dependent on personal preference!